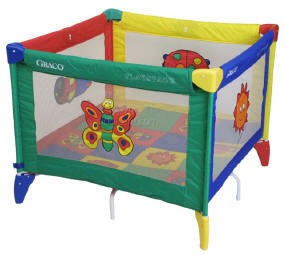 We have one travel cot available for babies up to about 9 months of age. Once they can stand up: we cannot risk issuing this cot to you. This Cot will fit in both our Double rooms and the Large Single room. We charge £5.00 per night for the use of the cot and its linen to cover the cost of our STRICT hygiene policy of laundering ALL the bedding and disinfecting the Cot and it's mattress after every use. Babies up to 2 years MAY share a Double or King-sized bed with parents at no extra charge - one child only. We also have a portable High Chair for use in our Breakfast Room for those wiggly little ones - you can borrow this to take out and about with you should you need it. We are also happy for children up to around 4 years of age to use our Floor Futon in the same room as their parents at no extra charge - again, one child only. Children using a separate bed / room of their own will be charged as per an Adult.